1998 North hiGH STREET, AS SEEN IN MAY OF 1971. 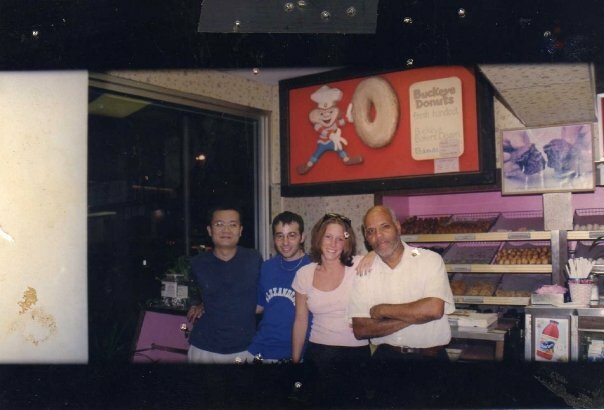 Current owner, Jimmy Barouxis (blue shirt) with friends in the 90's. jOHNNY bOY IN HIS RIGHTFUL PLACE WITH OTHER FRIENDS IN THE EARLY 2000'S. hALLOWEEN 2008 WITH RANDOM HOOLIGANS AND ZOMBIES. sTELLA, ONE OF OUR ORIGINAL STAFF FROM THE 70'S. STELLA, JIM BAROUXIS AND AN EARLY BUCKEYE DONUTS FAN. 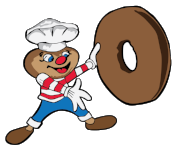 Yanni, one of our original donut makers. OUR DONUTS, MADE FRESH TWICE DAILY BY HAND. FOUNDED in 1969 by Greek immigrants George Barouxis, Jim Barouxis and George Sauter. ORIGINALLY a Jolly Roger donut shop. FAMOUS visitors include Prince, The Black Keys, Geroge Steinbrenner, Woody Hayes, Foster The People, ESPN and more. STARTED serving all-day breakfast and gyros in 2012. CORNERSTONE of classic, old school Ohio State campus culture.